What do you think of when you hear the word “perfect?” I think of three parts of my life, which inspired me to speak on this topic. As a resident of Irvine, I think of Irvine’s streets, parks, and plazas all neatly arranged, reflecting its residents’ values. As a former student, I recall high academic and extracurricular expectations put on students, like 5.0 GPA, AP classes, sports, and extracurricular activities. And as a guitarist, I’ve experienced the pursuit of musical perfection. According to Scripture, perfection manifests in two ways. 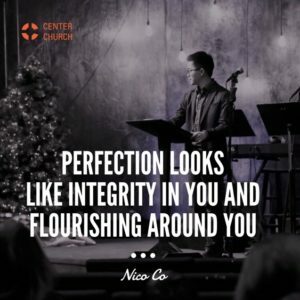 Firstly, perfection is integrity in you; James 1:2-4 uses the words “perfect and complete, lacking in nothing.” The Greek word for “perfect” is “teleios“ (mature, finished, or having virtue). This implies that God’s perfection has a purpose. In John 17:21-23, God calls the church to have perfect unity, just like the Father and Son; the purpose of our perfection is a solid relationship with our God, and the rest of his people. The word for “complete” is “holokleros” (complete in all parts, whole, without defect). This implies that God’s perfection has your whole life in mind. Jesus demonstrates this in Luke 2:52 when he grew in wisdom (intelligence, management), stature (maturity, physically), and favor towards God (vertical) and man (horizontal). We are to lack in nothing; we are to be secure in God’s grace and truth, and in Godly relationships. Secondly, perfection is flourishing around you. Adam and Eve’s mission was to transform Eden into a garden city, be fruitful (spiritual/physical results), multiply (descendants/discipleship), and subdue/have dominion (authority/rule). The Hebrew word for “subdue” is “kabash,” also used when Israel takes the Promised Land, and their place as his people. Similarly, God enacts his plan to protect and perfect the universe through us, as fulfilled in Romans 8:20-21, where it is set free in the glory of God’s children. C.S. Lewis says that “the rightful king has landed… in disguise” and calls us to a “great campaign of sabotage.” This is why we plan, manage, and grow our surroundings; it is why we love stories about fighting evil. Our inward perfection should manifest in a care for our surrounding community and place. I see it like pursuing music; it is a great comfort and joy. But lacking right motivation, preparation, or skill brings heavy insecurity or anxiety to the table. Similarly, when we live as we should – in the Spirit – Lewis calls God the “only comfort.” But as we do lack spiritually, God’s high standard can seem like a “supreme terror.” Sin has caused integrity and flourishing to be replaced by hypocrisy and rebellion. Let’s talk about hypocrisy/lying. In Matthew 23, Jesus says seven things about the hypocritical Pharisees; they do not know how to be saved, don’t teach others well, lie, only care about rules, are greedy, have a bankrupt character, and are wolves in sheep’s clothing. In the Gospels, notice that they act polite and call Jesus “teacher” when things are going well, but react with anger and name calling when things don’t go their way, throwing tantrums and even threatening to stone him. Hypocrisy happens when we care about appearances over the heart (1 Samuel 16:7). While God cares about the heart – which is why he picked little David as king over his brothers – sin’s idea of perfection has no correct purpose or whole self in mind. It is imbalanced, neglects different parts of our life, and only cares about what’s outside; we pursue perfect careers at the expense of relationship, reputation over calling, or online appearances over true connection. It can feel like your life is inconsistent, hollow, or meaningless. And we always cover up our weaker parts, putting the “best foot forward,” and defining ourselves by our works like the Pharisees. One common and overlooked way we hide is behind slogans. Musicians throw around phrases like “music is the universal language,” or “it’s all about the pocket.” Christians throw around phrases like “let go and let God,” or “God is good.” While these slogans aren’t a bad thing, they’re said loosely; few of us understand their real implications, and fewer of us live it out! As a result, flourishing becomes rebellion, or bullying. In Isaiah 14:12-15, we learn Satan wanted to be “like the Most High”; the same sinful desire is in us, as revealed modern society’s obsession for top 10 clickbait lists, the highest academic achievements, the leading sports stats, or the latest and most powerful technology. But this doesn’t cause flourishing around us. Instead, we climb to the top for selfish gain. We’ve seen so much of it in past years, as it has been throughout history: deadly mass killings, political scandals, corruption, abuse, and name-calling. Ultimately, we want to usurp God’s throne, like Satan. We put selfish desires over the truth that relationships matter – a common cause of holiday reunion tension – and this sin separates us from God, and from others. Have you heard of “impostor syndrome?” It’s the feeling that you’ll be found out, are inadequate, and that you don’t belong. We have high outward standards that we can’t meet unless we fake it, or hurt others to achieve it. We compare ourselves to, seek approval from, or idolize others. The result? You’ve surely heard the suicide statistics of our cities. It’s especially big in music; the Telegraph reports that musician suicide rates are 2-7 times greater than normal, in addition to many public examples of famous musicians abusing substances, and/or taking their own lives. So instead of having integrity and causing our surroundings to flourish, we lie and bully others, bringing judgement on ourselves. As a musician, what helped me with this problem was my teachers, who took the time to show me the joys and skills of the craft. It’s like the Gospel; undeserved help comes from outside you. Are there people that helped you in this way? JI Packer describes the feeling like this: “here is something to write home about – and something to live up to!” It’s a great feeling, and Christ saves us in this way. In Scripture, God’s presence moved from Garden, to Tabernacle, to Temple. Now by the incarnation in John 1:14, it moves to Christ (think carne asada; “carne” means “flesh” or “meat!”). He lived, died, and rose perfectly. But what made Jesus’ life perfect? Let’s summarize the rest of Christ’s life; born in an oppressed nation, Jesus’ family escaped Herod’s assassination attempt and mass killings. Some scholars believe Jesus’ father died early, and the Pharisees insult his mother in John 8:41. In John 6, Jesus loses most of his followers. Matthew 8:20 and 11:19 says he was not affluent, and hung out with the “wrong crowd.” And his bumbling followers left him, as he died like a shamed criminal, receiving the Father’s wrath. By American Christianity’s standards, Jesus had an imperfect life and unsuccessful ministry. Packer says “it meant a laying aside of glory; a voluntary restraint of power; an acceptance of hardship, isolation, ill-treatment, malice, and misunderstanding; finally, a death that involved such agony – spiritual even more than physical – that his mind nearly broke under the prospect of it.” Christmas is cosmic in scale, yet excruciatingly gritty in the details. The Jewish people thought the Messiah would defeat the Roman oppressors in power and glory. And yet Jesus, in the incarnation, moves from heavenly glory into our messes. In Nacho Libre‘s words, the nitty-gritty. I love Mark 9’s image of Christ going down the mountain, transfiguring back into a regular human, after briefly putting on his outward glory with Moses and Elijah. He could’ve stayed up there in the awesomeness! So what made Jesus’ life perfect, and why did he come down? John 6:38 explains; Jesus’ responses showed his care for the Father’s will. In 2 Corinthians 2:19, Paul talks about God’s power made perfect in weaknesses, as demonstrated by Christ near his death. Despite his soul being deeply grieved, Jesus’ response in Gethsemane – “thy will be done” – reveals integrity at his soul’s core. Enduring physical pain and the wrath of God, Jesus’ response on the cross – “Father forgive them, for they do not know what they are doing – reveals a deep care for our flourishing. In hard, vulnerable moments where we betray the truth to look good – as the Pharisees did – Jesus is perfect. He’s the real thing; no matter what, he obeyed the Father’s will. Would we respond with a “broken and contrite heart (Psalm 51:17),” like the thief on the cross, saying “we deserve punishment, but he has done nothing wrong”? How starkly Jesus contrasts with American Christianity, whose passion for God depends on fog machines, musical preference, mountaintop retreats, human strategic programs, free food and benefits, and high spectacle; how quickly this passion dies in difficulty or distraction, as Christ describes in the parable of the soils. And we give up on relationships, goals, resolutions, or beliefs just because we don’t see results immediately. Would we recognize Christ’s example in Hebrews 5:8-10, as he learned obedience from things he suffered, making him perfect? 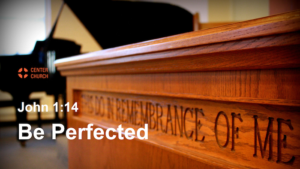 Going back to James 1:1-2, would we rejoice in trials we endure, achieving perfection? So as Christ died, obeying the Father’s will, his perfection covers our sin. The result is Hebrews 10:11-14; we are “made perfect” and “being made holy.” Hear Philippians 1:6’s guarantee; in Christ, the Spirit finishes the work, renewing the cores of our soul so they respond like Christ. And after his resurrection, Romans 8:34 says that Jesus still prays for us from heaven. After what happened Earth, you’d think he’d just want a break! How deep Christ’s commitment to our flourishing is. And as the holidays are difficult for many, would we have a similar compassion. This mindset shift helped me as a guitarist, too: when I shifted from being insecure about my musical appearances and results, to caring about a balanced life secure in God, I began to exercise my everyday responsibility to practice, eventually improving a lot! It freed me from fear, allowing me to be human and enjoy music again. And in the end, it allowed me to have relationships with my fellow musicians, and emphasize how we share the experience together. Similarly, God’s perfection allows us to be free of fear and shame, and have relationships focused on common identity, calling, and salvation from God. As my youth pastor Godfrey once preached years ago, let’s not be innkeepers with no room for Christ. Let’s see Emmanuel – God with us – becoming flesh and dwelling among us. Let us see his life as the source of our perfection. After I preached this message, we sang two songs; despite not being carols, they are extremely applicable to the Christmas story. … and “Before the Throne” describes what we gained from his suffering. Continue to be perfected by the Father’s will, the Son’s sacrifice, and the Spirit’s work. 1 According to your thoughts, emotions, and actions, what is the “good” or “perfect” life to you? 2 How have we lived as hypocrites and rebels? 3 How is the Holy Spirit perfecting you in the midst of imperfect results and gritty details?